Quick paced hiring and abrupt firing are nothing new in the IT sector these days. But over the last few years, the quantum leap in technology has led to more employees and even trainees getting fired. Plain professionals do not make the cut anymore. 1. Business Intelligence Analyst – professionals who analyze and derive insights from raw data. 2. Data Scientist – Uses Machine Learning algorithms to find patterns in raw data. 4. Artificial Intelligence Developer – Software can be trained to recognize objects and act on them. For example, the AI camera in your phone can recognize your face and apply relevant effects to it to enhance your photo. Google image search can be used to recognize similar photos. Facebook Messenger applies several effects to your face during a video call! 5. Internet of Things (IoT) Engineer – Solutions Architects and Engineers are required for this very new field. This technology allows common objects like your fridge, TV, home lighting, vehicles and music system to communicate with each other over the Internet. 6. Cloud Solutions Architect – Cloud refers to a number of online services offered by companies like Amazon, Microsoft and Google at the Infrastructure, Platform and Application level. Solution Architects (SA) use cloud technologies to plan and deploy cloud infrastructure according to the company’s requirements. SA’s can also automate deployments by writing scripts. 7. 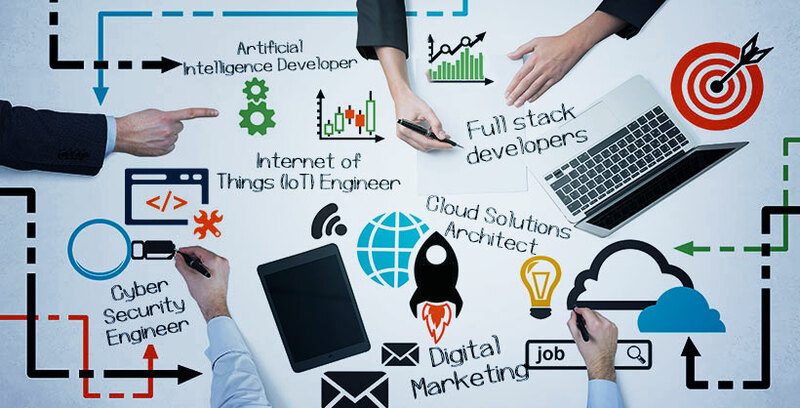 Digital Marketing – Solutions Architect and Developers are required to market products and services over several digital channels. 8. Full stack developers – Developers that build and maintain solutions for e-commerce and blockchain projects. Out of these job roles, Data Scientists and Data Analysts seem to be the most wanted this year! Check out our career page to know more about the career openings in our company and be part of our amazing team.